We're excited to announce a new way for everyone to support our research & help us find cures and provide vision saving surgeries! Not only can you purchase one of a kind works of art, but you are welcome to sell your items and donate 10-100% of the profit to The Eye Defects Research Foundation. We've made it easy for everyone to sell unwanted jewelry, clothing or collectibles all to benefit our vision saving mission. Help us & get involved! 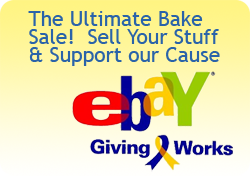 Maybe you have an expensive item & not sure how to go about listing it on Ebay? Give us a call, we'll help you or do it for you! Share our events with your friends and family by following us on Facebook! We need you now more than ever, so please join us on Facebook. Write a review for us on Great Non-Profits.org. Your inspiring words could make a difference in someone's life and could influence a donor to give. Join our Board of Directors! We're embarking on a search for those who want to see research advances. Can you make a difference? If so call us today to discuss your options. We need you now more than ever & we have so many new ways YOU can help!